Edward Wright’s output was modest, though it spanned many kinds of media, and some of it is already lost. 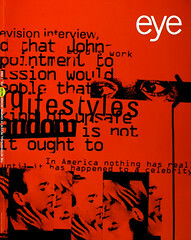 But his importance and energy – as designer, teacher, artist, and “culture carrier” – was large. Eye reassesses Wright’s place within Britain’s buried history of dissident Modernism. His work slips free from the nooses of British culture. The man himself was like this too: nimble, shy but definite, informal with grace and dignity, carrying minimum baggage, taking risks but always landing on his feet. With good reason do his friends liken him to a cat. Now, five years after his death and scarcely present in the public record, it is necessary to explain almost everything about Edward Wright’s work, and where, how and why it doesn’t fit in. “I suppose I had an acute sense of being uprooted,” he wrote in an autobiographical essay. That is one of the keys. It joins Edward Wright to the considerable number of exiled and émigré artists, who, it often seems, have provided Britain – and England in particular – with much of what has been of value in its culture in this century. He was born in 1912 in Liverpool, where his father was an Ecuadorian vice-consul. His mother was the daughter of the Chilean consul there. So the English-sounding name is misleading. Edward Wright was bilingual in Spanish and English: a fact that helps an understanding of his paradoxes. Some of his earliest years were spent in Barcelona, and his sense of uprootedness can only have been heightened by the years he spent in an English public school. Then in the 1930s he went to the Bartlett School in London, to train as an architect. He practised belief, travelled, and went with his family to live in South America before returning to England in 1942. In the aftermath of the war, he emerged as a painter and maker of objects, who know about typography and printing, was passionately interested in cinema, was a writer and wide reader too. Later in life, he became a teacher of graphic design – though “a culture carrier who helped a lot of people” would be more accurate description. It is hard to find a way into a discussion of such a wide field of activity: but Wright’s public lettering provides a remarkable and still partially available body of work. Go to Scotland Yard, the headquarters of London’s Metropolitan Police. In this dull site, there is a small spark of life: in front of the architecturally banal building is a sign whose shining metal letters brighten even the dirtiest weather. The triangular support echoes the shape of the site, where Dacre Street meets Broadway. And – revolving – the whole object engages in a dialogue with its context. The lettering is one of Edward Wright’s best alphabets. As usual with him, the forms were generated by a set of tough constraints: circles and lines only, the terminal points sheered off at right angles to the stroke. Geometric letters are often stiff and unusable, but these – characters subtly off centre and varied – sing with life. Wright wasn’t so fond of the police and had doubts about the job, with included signs throughout the building. But having taken it on, he carried it out with full commitment, leaving London with this quiet surprise. The New Scotland Yard album was named Flaxman. At that time London’s telephone exchanged had alphabetic codes, and this was the code for Chelsea. Wright was then overseeing an educational commune – known as the graphic design department – at the School of Art there. But the joke had some point: in its simplicity, the alphabet had the spirit of ancient Greek inscriptions. One might call it neo-classical, like the sculpture of John Flaxman. Wright’s signing and lettering work happened because he knew architects, especially the people who in the mid-1950s began to build modern architecture in Britain. More importantly, it happened because he understood spaces, and had no prejudices or difficulties in working with the materials of modern buildings: concrete, metal, glass, plastic. His letters become part of the fabric. One of his first jobs in this field was the lettering for the House of the Future: Alison and Peter Smitnson’s project for the 1956 Ideal Home exhibition. The expanded forms of the letters matched the long, low form of the structure, and again followed a set of extreme constraints. A string of other projects followed. The high point was the painted mural sign for Theo Crosby’s building at the International Union of Architect’s Congress, put up on London’s South Bank in 1961. The four languages of the event and the rough, provisional nature of the structure was temporary and is known now only through photographs and memories. Given the appalling and apparently incurable indifference of architects to lettering, this part of Edward Wright’s achievement is very much worth rescuing and celebrating. It is far from the usual tired routine of a typeface blown up big and stuck down on the drawing, on the building. It is also far from the anaemic architectural efforts of the English letter-cutters. Here Wright exhibited his foreignness and his value to us. “In the summer of 1952 Anthony Froshaug asked me if I would outline a part-time course for his students of typography at the LCC Central School of Arts & Crafts,” Wright once recalled. This conjunction of a place and some people was one of the series of occurrences in London in those years which constituted a stream of running outside and against the established culture. Perhaps this stream was just a trickle, but it has widely dispersed, lasting consequences. At the Central School, “we used a hand press, wood type and rules for our exercises; this resulted is a situation where the teacher could learn from the pupil as well as vice versa, sometime both were surprised at the results.” The visual evidence remaining from that class is a handful of printed sheets. These prints still look fresh today, and take their place in the honourable modern tradition of making it new with what is to hand. So at the Central School at that time there was the typographer Anthony Froshaug, who, in brief was Wright’s opposite and equal as a designer and teacher. Eduardo Paolozzi (textiles) and Nigel Henderson (photography) ran contingent classes. Among the students were Ken Garland, Derek Birdsall, Bill Slack, Philip Thompson, Ivor Kamlish, Colin Forbes, Alan Fletcher – and more. Some are now well-known, some hardly known at all. But they, with others from other London schools, were the first generation of fully professional graphic designers in Britain. Wright’s work was one available element in their education, which in its cross-category drive helped to mean that “professional” had none of the business studies reductivism it has now taken on. Some of the full-time Central students came to Wright’s evening classes. Outsiders who came included the designer Germano Facetti, the architect Pat Crooke, the cultural historians Joseph Rykwert and Bernard Myers. The architect Theo Crosby was also around at the Central, and a litter later, when he was editing the magazine Architectural Design, he began to pass work on to Wright. This “scene” had its most public centre at the Institute of Contemporary Arts. Edward Wright appears fleetingly in the comprehensive documentation of the Independent Group, which grew up within the ICA. He took part in “This is Tomorrow”, the IG’s show at the Whitechapel Art Gallery in 1956, and designed its catalogue. But while he shared the spirit of curiosity and experiment with these others, there are clear differences between Wright and the other Independent Group, especially as it shaded off into Pop Art. Wright certainly had a vision of a democratic culture. “We can’t withhold feelings for rare occasions and at the same time keep them alive,” he once wrote. This fires everything he did. But where the Independent Group famously looked to the new world of the North American consumer, Wright’s “America” lay to the south. It was Hispanic, poor old-colonial but liberating itself through resistance and rebellion, through secret codes, strange unexpected happenings, down-to-earth practical construction. Where Pop Art dreamed of listening to Elvis in a Chrysler car, Wright’s vision was active: making something out of disregarded materials. AlOl this has its aftermath in present cultural debates, now dominated by the nihilism of “cultural studies” theorists unable to make judgements of value. But in Wright’s politically constructive vision, the poetry of Pablo Neruda, the old Argentinean tango, a balsawood raft, the flaneur who measures distance by the cigarette – these are all culture, and valuable because humanly available. The work that Wright made for the public sphere – architectural lettering and (very important to him) posters – had its dialectal counterpart in his long concentration on the book, as a tool for solitary thought and contemplation. In the late 1950s he worked at Rathbone Books, essentially a book packaging firm, which had grown out of the wartime venture of Adprint. The company was run by an émigré from Vienna, Wolfgang Foges, and in its early days gave work to many of the continental Europeans in England: among them John Heartland, George Adams, Lewis Woudhuysen, Otto and Marie Neurath. One imagines that Wright felt easy enough here, among others who didn’t belong, though the things that resulted – early exercises in the integrated book – now seem unremarkable. It was this kind of unapologetic employment in the commercial world that helped to seal his exclusion from the British art scene. The paintings he was then making – making with full command of his materials – have aged well. Often about and embodying the theme of communication, they need to be scene in public, as they were, briefly, at this 1985 Arts Council retrospective. This was a “regional” show, initiated by an ex-student (the designer Trilokesh Mukherjee), carried through by an independently minded curator (Michael Harrison), and largely unnoticed in the art press. Why are Wright’s paintings not in public collections? There seems no point in asking. If they were there, then everything in Britain would of course be different. The most private books Edward Wright made were the sequence of notebooks he wrote and drew in, from 1953. In this books – constant in their non-standard elongated format, rough hessian binding, pages made of detail paper or cheap yellowing paper – one finds a dialogue with himself about the things he was doing and making. Of course the assembling of fragments is what notebooks are for, but this was also the system of much of his finished work. Wright himself traced this to his early years in his father’s office. “Liverpool in those days was a very busy port with a large trade in imported and exported merchandise. This meant that when the consulate was handling invoices, bills of lading and so forth, there was a variety of seals, rubber stamps and embossing dies being applied to the documents…” He went on to describe the “much more serious apparatus” of a press and a folio book of numbered blank pages, on to which typewritten correspondence was copied, via dampened blotting paper. From his first notebooks one can trace the slow formation of a work that embodies much of Edward Wright. This is the silk-screened fan-folded Codex Atorrantis, printed in 30 copies. It was finished only in 1984. By this time Wright was living in retirement in Cambridge, a small garden shed acting as his workshop. He had a proofing press and some type. The codex – that is the precise description of its form – is quite roughly made and free of grand summarising gestures. The chief subject is lunfardo, the slang of the vagrant people of Buenos Aires. This code was a medium that carried a human culture: in resistance to the mechanisms of official control. The book works as a kinetic construct. A single sheet of brown wrapping paper, printed on the rough side, is held between springy plywood covers. The paper is folded into facing pages that may make one spread of words or a pair of contrasting images. Vagrants (atorro) face a state-issued postage-stamp bull, ironically labelled lastre: food. A truant boy drinking milk (from Truffant’s Les Quatre Cents Coups) is labelled yirar (roam) and faces some raft travellers (yugo, work). The connections may be loose and dreamy, but – as usual – there’s a strict grid keeping the rough elements in place.